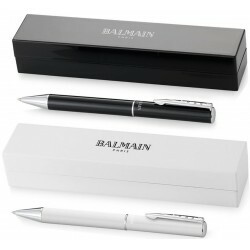 Balmain Pens There are 4 products. 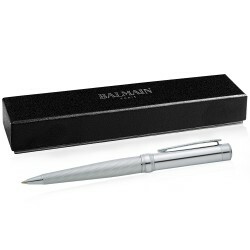 Exclusive design lightweight metal ballpoint pen with matt brushed silver with chrome coloured details with new style Balmain® clip. Twist action, premium Swiss quality black refill and packed in a Balmain® gift box. Exclusive Balmain® design twist action, featuring striking ebony black bottom barrel with mirror-finish chrome upper barrel. Signature Balmain® middle ring and chrome accents complete the fashion house design. Pen includes premium black ink cartridge. 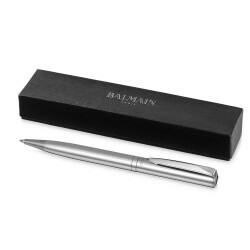 Exclusive Balmain® design twist action ballpoint pen. High polished chrome upper barrel is combined with a contemporary satin chrome lower barrel with a striation pattern etched directly into the barrel. The mixture of satin and polished chrome accentuates the dimension of this style. 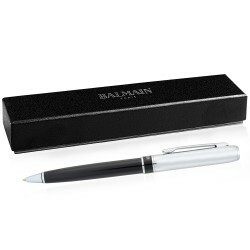 Contemporary exclusive twist action design metal ballpoint pen presented in a matching lacquered Balmain gift box (size: 160 x 35 x 30mm). Supplied in black ink. Engraves mirror silver.